Sylvia Chave, aka "The Queen of Halloween," will be celebrating her favourite time of the year with three concerts for young children, October 27 and 28. ~ Thursday, October 27, 10:30 a.m.
~ Thursday, October 27, 1 p.m.
~ Friday, October 28, 10:30 a.m.
Tickets are on sale at The Refinery Box Office, 653-5191 or online. Tickets are $5 in advance and $7 at the door. Children under 2 are free, and group rates are available for schools and preschools. 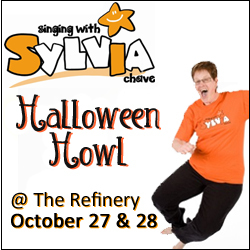 As a special Halloween treat, Sylvia will be giving away pairs of Halloween Howl tickets to three lucky saskmom.com followers! To enter, share the dates and times you're interested in, and the costumes your family are planning for this Halloween. Sylvia will be giving away one pair of tickets per show through saskmom.com. Each will recieve two complimentary tickets to the show during the specified time frames. Thanks to all for entering and sharing your cute costume ideas! And, thank you to Sylvia for this great give-away.